seems like the fall colors are in full effect here in nyc and we've had some gorgeous warm days to wander around the city and enjoy! we've been busy working and playing so far this month - our friend ashleywas in town cooking on a yacht and we had a blast planning menus together and creating dishes in the galley. we'll be posting a few of the delicious dishes we came up with here soon - like sausage pretzel crostini and asian lobster buns! before she headed off to morocco we met for drinks at the breslin in a newly discovered cozy nook upstairs. looking forward to the holiday issue of sweet paul magazine to come out next week! sporting these cute new toms to support movember and raise awareness for cancers affecting men. we've had 2 memorably great meals out recently - an indulgent comfort food filled dinner at the redhead and amazing pizza at Co.
hope you enjoy this cute little jam tartlet - perfect afternoon snack . . . or sweet treat for breakfast! in a medium bowl, combine flours, sugar and salt and stir. add butter and using fingers or pastry cutter, work mixture until it resembles a coarse meal with some small pea-size lumps. in a small bowl, whisk together yolk, extract and water and add to flour mixture. stir just until dough comes together and forms a ball. divide dough into 2 balls, flatten into disks and cover in plastic wrap. chill 1 hour. preheat oven to 375 degrees F and lightly grease four 3 1/2-inch tartlet pans with removable bottom. keep on disk in the fridge and cut one disk into 4 equal portions and roll each out between sheets of parchment into a thin round slightly larger than the tartlet pan. transfer each circle to the prepared pan and press lightly to fit into pan. prick the bottom of the tart dough with a fork and chill for 15 minutes in the freezer. bake 15 to 20 minutes or until shells are golden brown. let cool slightly. distribute jam among 4 pre-baked shells, filling almost to the top. cut remaining disk into 2 parts and roll into circles about 1/8-inch thick. cut into long thin strips with a knife or pastry wheel. 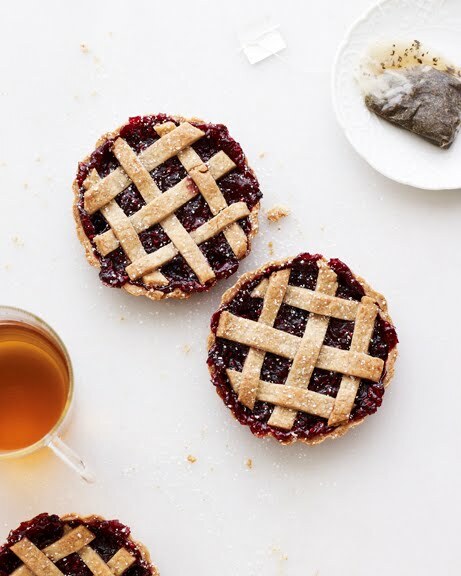 assemble a lattice top across each tartlet, trimming the edges of all strips so they are flush with the edge of the pan. bake 20 minutes or until jam is bubbly and top is golden brown. let cool, 15 minutes in pan and then remove from tartlet pan and cool completely on rack. dust with confectioner's sugar before serving. enjoy! Those look great! My wife however hate raspberries, I wonder how they would do with strawberries or cherries? These tarts are too cute and perfect - love them and your blog is awesome!